Saudi Arabia and the 28 classified pages of Congress' 9/11 report. 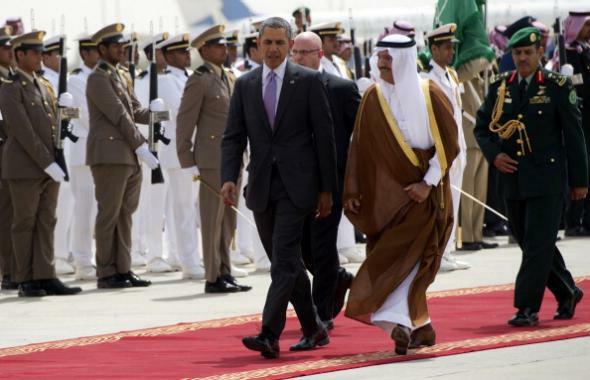 President Obama with Prince Khaled bin Bandar bin Abdul Aziz of Saudi Arabia in Riyadh on March 29, 2014. Sunday night, 60 Minutes ran a segment about ongoing efforts to convince the Obama administration to declassify 28 infamous pages in an otherwise public 2002 congressional report which reportedly document allegations that Saudi Arabian nationals in the U.S. and elsewhere materially supported some of the 9/11 hijackers. The “28 pages” have been controversial since the report in which they were supposed to appear was issued and seem likely to stay in the news this year as the 15th anniversary of the 9/11 attacks coincides with the end of Obama’s term in office. Here’s a brief guide to the subject. Who wrote these 28 pages? They’re part of the report issued by the Joint Inquiry Into Intelligence Community Activities Before and After the Terrorist Attacks of September 11, 2001. The Joint Inquiry was conducted in 2002 by the Senate and House intelligence committees under the leadership of Democratic Florida Sen. Bob Graham and Republican Florida Rep. Porter Goss. The Joint Inquiry investigation preceded the work of the 9/11 Commission, which released its own report in 2004. Why hasn’t the section about Saudi Arabia been made public? It’s an executive branch decision. President Bush said that the redacted section would reveal “sources and methods that would make it harder for us to win the war on terror.” It’s also assumed that the information was withheld in part to avoid embarrassing a country with which the U.S. has a longstanding and controversial military, intelligence, and economic alliance. The Philadelphia Inquirer has reported that President Obama told relatives of 9/11 victims in 2009 and 2011 that he would release the files, but that hasn’t happened. The administration said in February of this year that the process of “asking the intelligence community to conduct a classification review of this material” is “ongoing.” Obama, as it happens, will be visiting Saudi Arabia next week. If they’re so secret, how do we know anything about what’s in the redacted 28 pages? Public figures who’ve seen them (or were involved in their production) have described them in general terms. Members of Congress are allowed to read the pages but not to discuss their details publicly; members of the 9/11 Commission also saw the redacted pages in the course of their own investigation. On the other other hand, more than one member of the 9/11 Commission—including former Democratic Sen. Bob Kerrey, who spoke to 60 Minutes—has said that the “found no evidence” sentence should not be considered an exoneration of the Saudis. (Note the careful, vague phrasing—“as an institution,” “senior Saudi officials.”) Zelikow, meanwhile, worked for the Bush administration in 2000 and 2001 and from 2005 until 2007; he’s been accused of going soft on the White House during his tenure as the director of the commission. So … what’s going to happen? I don’t know! I can’t see the future. But here’s my news-blogger prediction, which is probably worth what you paid for it: Obama eventually releases the documents, and they turn out to include some legitimately maddening information about support that wealthy and/or powerful Saudis gave to al-Qaida before 9/11—but don’t ultimately implicate the Saudi power structure as a whole enough to substantially change our country’s friendly/weird/sleazy relationship with the kingdom.